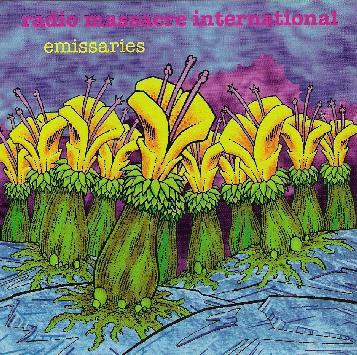 Radio Massacre International - "Emissaries"
Radio Massacre International are a British trio who play a brand of Space Rock that will transport you back to the glorious 70's, when bands like Pink Floyd, Tangerine Dream, Ash Ra Tempel and Hawkwind were defining the Kosmiche music genre. The band consists of Steve Dinsdale, Duncan Goddard and Gary Houghton on an arsenal of vintage and modern keyboards and electronics, guitars and percussion. The trio has been playing together since 1979, first as a band called DAS, which released 12 albums between 1980-87, and have recorded together as Radio Massacre International since 1993. Emissaries is a 2-CD set, the first being a studio set of 6 tracks that make up the hour long Emissaries Suite, and the second documents a live radio performance from 2004. The opening sounds like the intro to an old Pink Floyd or Klaus Schulze album, with cosmic drifting keyboards, assorted freaky sounds, and trippy flute and horn emulations. After about 7 minutes the guitar starts to jam and the main keyboard theme kicks in, bringing us deep into Tangerine Dream territory. The guitar remains in the forefront along with the keys, which makes for a really gorgeous blend of old school Tangerine Dream and Pink Floyd, with guitar patterns that sometimes have a Manuel Göttsching flavor to them. So you're probably getting the picture that Radio Massacre International wear a lot of influences on their shirt sleeves, which is just fine because they do it as good as any of the pioneering 70's bands, in the process creating a non-stop hour of mind-bending Kosmiche music. And that's not all… the music on the Emissaries Suite is based on a comic strip written by artist Matt Howarth, who wrote it specially for Radio Massacre International. Open Windows Explorer and click your CD drive and you'll find a PDF that contains the Howarth comic that the music is based on…. read it while you listen to the music under the headphones for a cosmically enhanced experience. The second CD consists of 76 minutes of a 2 hour performance from May 2004 on the Star's End radio show on WXPN, Philadelphia. There are 6 lengthy, lusciously cosmic tracks for the astral voyager in all of us. If you're a fan of Phaedra/Rubicon era TD then there's a couple tracks here you have absolutely got to hear. I love the ripping guitar against classic TD sequenced keyboard patterns on "Mobile Star Systems", which also brings to mind contemporary Space Rock band Architectural Metaphor. "A Piano Wanders the Incandescent Vapours" and "Sympathy for the Bedeviled" are slowly rolling space voyages with a distinct Pink Floyd flavor with the jamming Blues guitar against a space atmospheric backdrop. Wow, this is really wonderful stuff. Emissaries is my introduction to Radio Massacre International, and a peak at their web site indicates a fairly massive output. Looks like I've got some exploring to do. Highly recommended. For more information you can visit the Radio Massacre International web site at: http://www.radiomassacreinternational.com.